If you couldn’t make it to Charm of Finches‘ concert ‘Into the Night’ on Feb 17th, you have another chance to hear us at our house concert appearance through Groupmuse on April 7th, 3PM. House concerts are rapidly becoming one of the most popular venues for both the artists as well as the audience members. With a warm environment to perform for an captivated audience always sets for a unique musical experience. The unique connection between the artists and the smaller audience makes it is easy to see why so many artists and seasoned music enthusiasts are drawn to these events. A packed house with a ‘rapt and enthusiastic audience’, the audience came from all over the Greater Toronto Area…from far and wide, to see our concert today. Thank you, audience, for your applause and kind compliments for today’s concert. We strove to raise the bar and to do new & different things. It was a big challenge but everyone worked very hard and collectively, we rose to the challenge. We were thrilled (as always) to be able to share our music with all of you. Sunday February 17th in UofT’s Victoria Chapel join the Charm of Finches as they journey through the mythical, mysterious and macabre. This wicked program features newly commissioned flute quintets by Canadian composers Germaine Liu and Eileen V. Padgett, as well as the Canadian premieres of works by Ian Clarke and Anže Rozman. Known for their exploration of a broad range of genres and unexpected stylistic pairings, with this program the Finches continue to challenge the audience’s sonic expectations of the flute. The group will be joined by sound engineer, Matt Miller to help spin musical tales of vengeance, death, spells and spirits. The perfect palette cleanser for the Valentine’s day weekend “Into the Night” offers a taste of the darker side of human emotion. This event is made possible with generous support from the Toronto Arts Council and Ontario Arts Council. 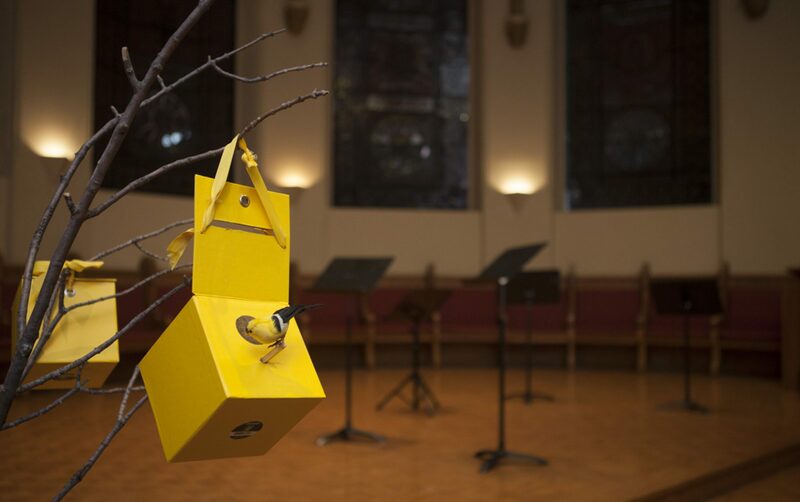 Incredibly thankful for the feature story on Charm of Finches and our upcoming concert, ‘Circle of Sound’ on June 17th, Sunday, 7:30 PM, Hart House, East Common Room (7 Hart House Cir, Toronto). Charm of Finches, Canada’s Premiere Flute Quintet: Charm of Finches’ musicians are mavericks in the classical genre – all young, vibrant and electrifying musicians – and the force behind brilliant new arrangements and compositions with a reputation for delivering fresh and energetic concerts. This concert features the Toronto premieres of Mendelssohn’s A Midsummer Night’s Dream, arranged by Gudrun Hinze, and David Heath’s Return to Avalon for SEVEN FLUTES, joined by Kelly Zimba and Camile Watts. The programme also includes the world premiere of “First came the temple” written by Toronto-based composer, Bekah Simms. And to round off the evening with Raga Terah by JUNO and three-time ECMA award-winning Canadian composer, Derek Chark. Don’t miss this opportunity to hear these incredible musicians up close and personal, in the intimate venue of Hart House, East Common Room. This event is made possible with generous support from Burkart Flutes. Join us for this one-of-a kind event as we perform an ALL CANADIAN programme for flute quintet (it’s the FIRST time for us). Grab your ticket ASAP as only limited seats available. May 3rd, 5:30 PM, Canadian Music Centre (20 St. Joseph Street, Toronto). Trevor James Flutes Alto Flute Contest Outtakes: Things didn’t always go according to our plan….the countless times we tried to record a greeting, contagious laughter, the banging noise “aka radiator”, dancing, the list goes on. Nevertheless, we had an amazing time, lot of fun, and laughs, ENJOY. For us, the chamber music plays an important role through the shared experience of creating music together. There is no camouflage. Everyone plays an equally vital role in the collective success. Not only do you learn how to play, but you learn how to communicate and share with others. We are extremely thankful for our generous colleagues and friends who have lent us their alto and bass flutes. We don’t actually own either and it can be tricky as the intonation of each instrument will vary. What does the flute (in this case, alto flute) mean to us? Flexibility that be gained from owning our own instrument can improve the cohesion of the group musically, bringing us closer as an ensemble and relieve a financial barrier for success. Five flutes – one stage. Canada’s premiere flute quintet takes the stage at La Rev to play tunes you’ll recognize from classical flute music (like Debussy), music by Canadian composers working today, and pop tunes arranged for flute quintet. Come out and see flutes of all different shapes and sizes playing together in harmony!